"We have people coming to our city for the sole purpose of spewing hate. It didn't make sense last year, and it doesn't make sense now," said Washington's mayor. 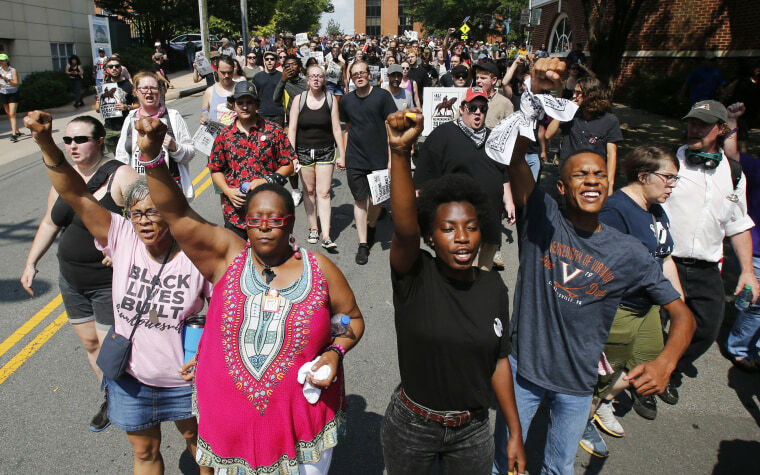 CHARLOTTESVILLE, Va. — Residents, protesters and others gathered in this Virginia city on Sunday to mark the anniversary of tumultuous clashes that took place one year ago, renewing heated discussions about the state of race relations in America. On Sunday, a gathering of college students, clergy members and anti-fascists remained peaceful as they waved flags, played music and chanted. Meanwhile, in this city's downtown, dozens of people gathered to pay respects to Heather Heyer, the civil rights activist who was killed one year ago amid violent clashes between white nationalist and anti-fascist counter-protesters here. Video later showed that officers at last year's rally watched as people were beaten, and a scathing independent report released in December found multiple failures by Charlottesville city officials and police. But on Sunday, dozens of officers — some wearing riot helmets — guarded Heyer's memorial site, the road where she died that also now carries her name. Heyer, 32, was killed when James Alex Fields Jr. plowed through a crowd of counter-protesters at this very site one year ago. Two Virginia state troopers also died when their helicopter crashed as they helped monitor the scene. Now Heyer has become a symbol of opposition to the white supremacist organizations that took to these streets in protest last year. At the site where she was killed, people laid flowers and signs that said "LOVE" or wrote phrases like "NEVER FORGET" with chalk on the sidewalk or bricks of the nearby building. Dozens of people here began linking arms and putting their hands over their hearts in the early afternoon. Nearby, volunteers handed out water and snacks on this hot Virginia day. Susan Bro, Heyer's mother, told MSNBC she plans to join the people there and put flowers on the street on Sunday to commemorate her daughter's memory. "Then I'm going to keep continuing with the work as I see fit — to move racial justice forward," she said. Events centered on peace and healing are taking place in Charlottesville this weekend amid cordoned off downtown streets. Police arrested three men on Saturday in separate incidents. One for trespassing twice in a cordoned off zone, the second for possessing prohibited items and the third for being drunk in public. An organizer of the first Unite the Right rally wants to attract a few hundred people to a park near the White House, while at least three counter-demonstrations will congregate elsewhere in the city — in hopes of drowning out their rhetoric. Upwards of 4,300 people could collectively descend on D.C. on Sunday, according to the permit applications filed to the National Park Service, including members of Black Lives Matter and Shut It Down D.C., a coalition of counter-protesters. About 1,000 police personnel are expected this year in Charlottesville — long known as a charming, liberal college town — while its downtown will be on lockdown. Pedestrians will only be allowed access through two checkpoints. Kessler did not immediately respond to a request for comment, but told NPR in an interview Friday that his goal with a second Unite the Right rally is to "stand up" for free speech and criticize anti-fascists, also known as Antifa, a loosely organized coalition of protesters, left-wing activists and self-described anarchists. Kessler also told NPR that neo-Nazis would not be welcome at his rally, although a permit filed with the National Park Service says that speakers on Sunday will include former KKK leader David Duke and Patrick Little, a documented Holocaust denier who ran as a GOP Senate candidate in California and was endorsed by Duke. While police are out in force this year, the Unite the Right rally in Washington likely won't be as energized if it lacks the amount of far-right groups who showed up previously. Keegan Hankes, a senior research analyst at the Southern Poverty Law Center, which tracks hate groups, said the white nationalist movement has become much more disorganized without any central leadership. Hate groups have long festered within American society, he said, but Charlottesville proves that people are powerful if they come together to mobilize against them. He points to the turning tide in the city itself in the past year, which has seen its first black, female mayor elected and installed its first black, female police chief. Daniella Silva reported from Charlottesville, Virginia. Erik Ortiz reported from Washington, and Phil McCausland reported from New York.